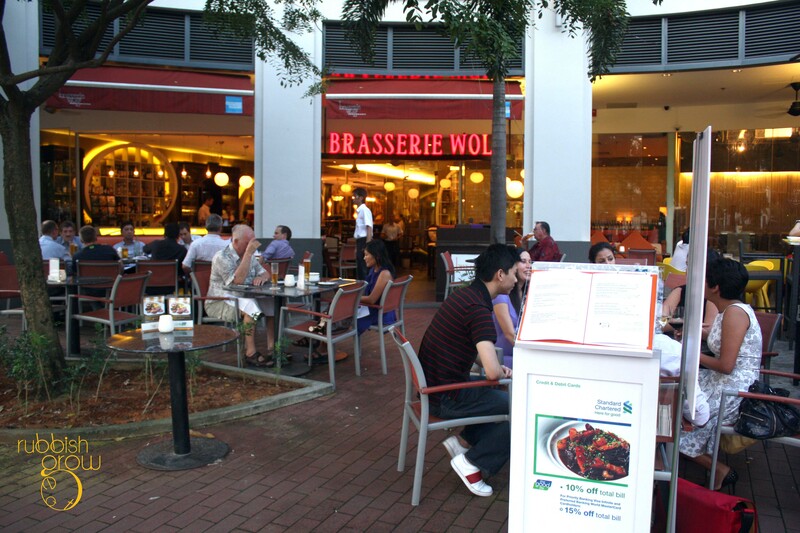 CLOSED: The Esmirada Group has rebranded Brasserie Wolf to Hazenhaus, a German bar-restaurant. Remember the young Chef Claudio Sandri from Bosch event? No? We do, how can we forget such a charming chef? But can someone so charismatic cook good food? Initially, we had our doubts. 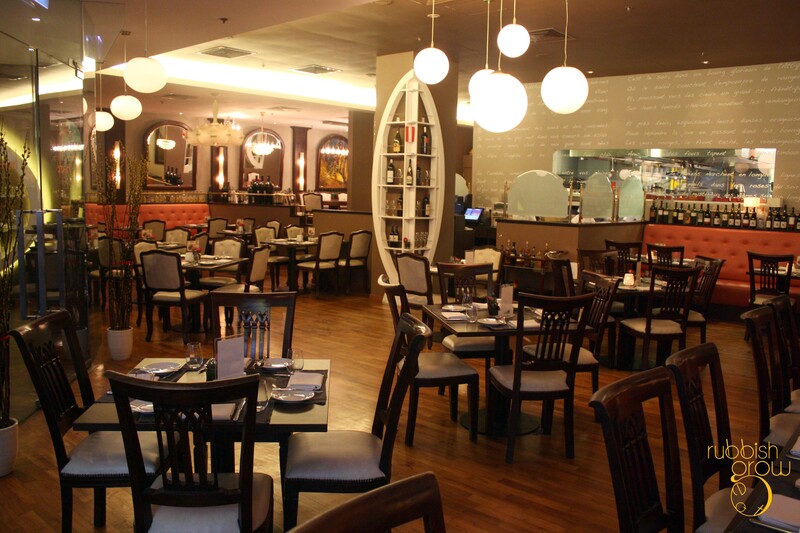 Read on to find out if Chef Sandri confirms or repudiates our suspicion. Even before the food, the cocktails are amazing. 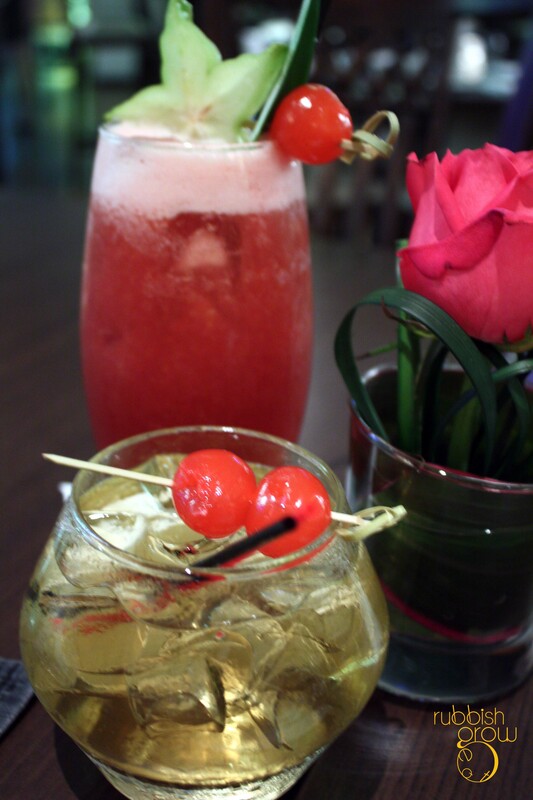 We had the good fortune to taste the in-house mixologist’s drinks at the Bosch event. So yummy! This time, we had Red Velvet ($20) laced with Russian vodka, raspberry puree, cranberry, cherry brandy and starfruit, and the Amber Bowl ($18) with rum, apple juice, vanilla syrup, and orange bitter. Both are very well balanced, sweet, tangy and tasty. If you don’t like the bitter taste of alcohol, go for the Red Velvet. But be careful, they are deceptively light and by the time you know it, you’re already drunk. 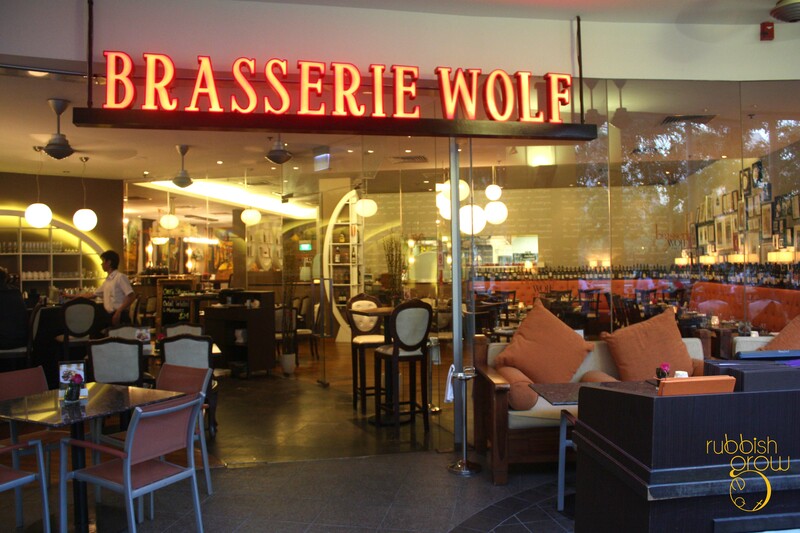 The value-for-money set lunch menu costs $21.90 (2-course) and $31.80 (3-course). A set brunch menu is available on Sat and Sun (12-5pm) at $39. Another value-for-money trick is to come early for dinner (6pm-7.30pm, M-F) for the Early Bird Dinner Special with a 3-course menu at only $35+ a person. 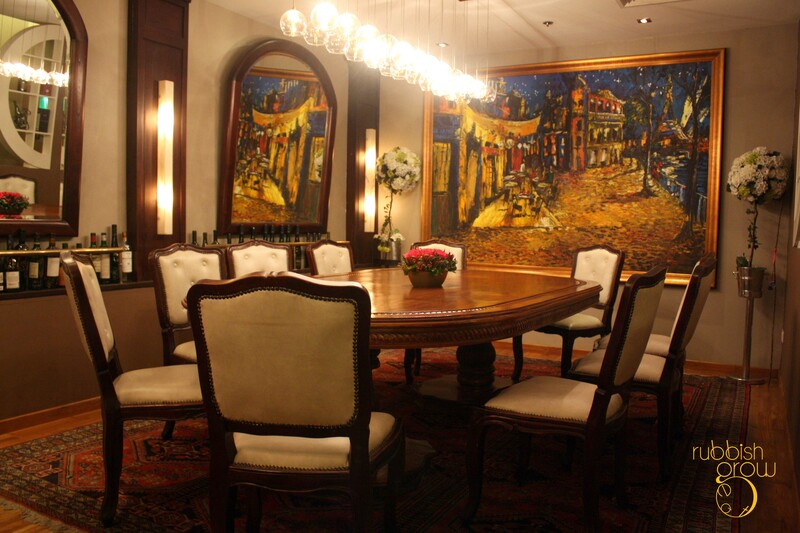 You may also have an a la carte tasting menu at 3-course ($80) or 4-course ($95). For starters, the josper grilled rougie foie gras ($26) is accomplished with the very crispy outside and the buttery, soft inside. No hint of the liver stench at all. 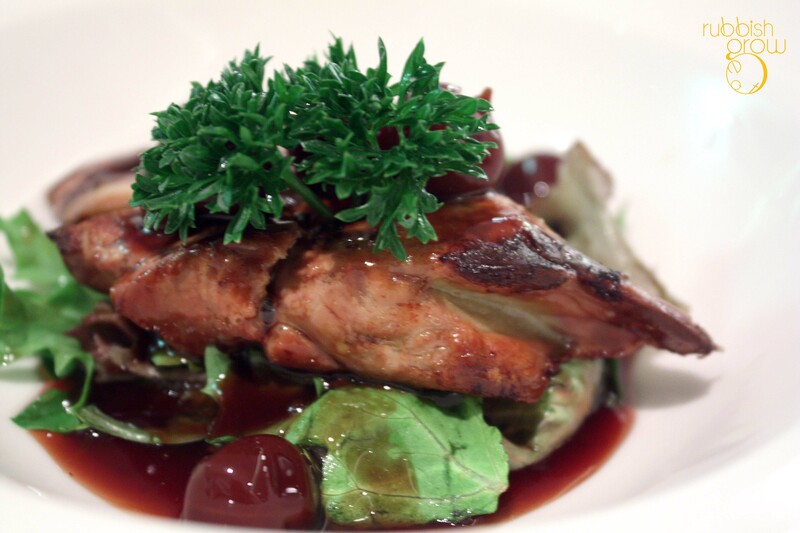 The very tart griottine cherry sauce adds a perk-you-up effect. Testing Chef Sandri’s skills with traditional French food, what could be more traditional than the traditional French onion soup ($17) with gruyere cheese and toast? 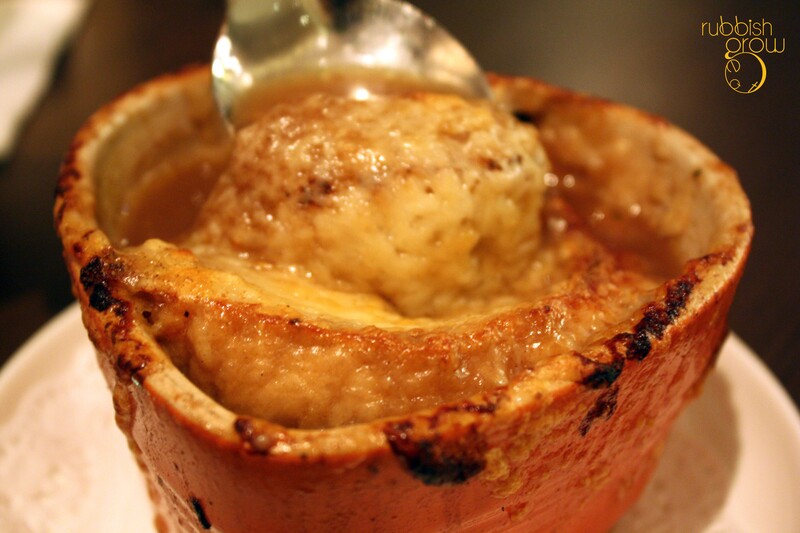 Comparing with the best French onion soup we had at Bistro du Vin, we found Chef Sandri’s onion soup different. It has a clear separation of tastes, starting from mild saltiness of the cheese, sweetness of onion, and then a slight and pleasant sourness as an aftertaste. 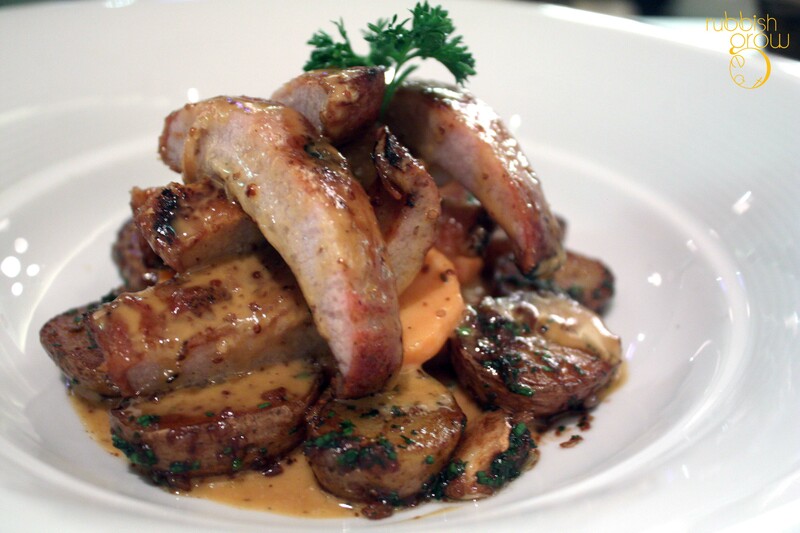 Dish of the night goes to Grilled Iberico pork cheek ($35) with roasted potatoes, “vichy” styled carrots in a mustard sauce. ORGASMIC!! Grilled any longer, the pork would be overcooked but grilled a second earlier, it would lose that charred crispy delicious skin that it has. Crispy skin, tenderest meat. Even the vegetables are perfect in this dish. The mustard sauce has so many herbs and ingredients as Chef Sandri listed them–I can’t follow to write them down–but it is a sweet, creamy sauce. Every bite is a delight. 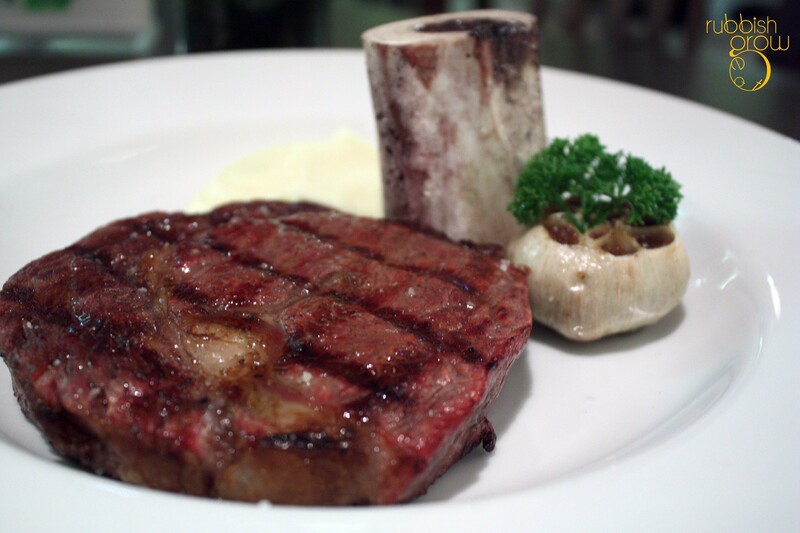 USDA choice rib eye (220gm, $40) with bone marrow, bordelaise sauce, stewed onions and mashed potato: The Josper Grill really makes a difference, sealing in the favors, making the steak juicy and extremely savory. Good on its own but you may also add the stewed onion on it to eat. Very delicious. 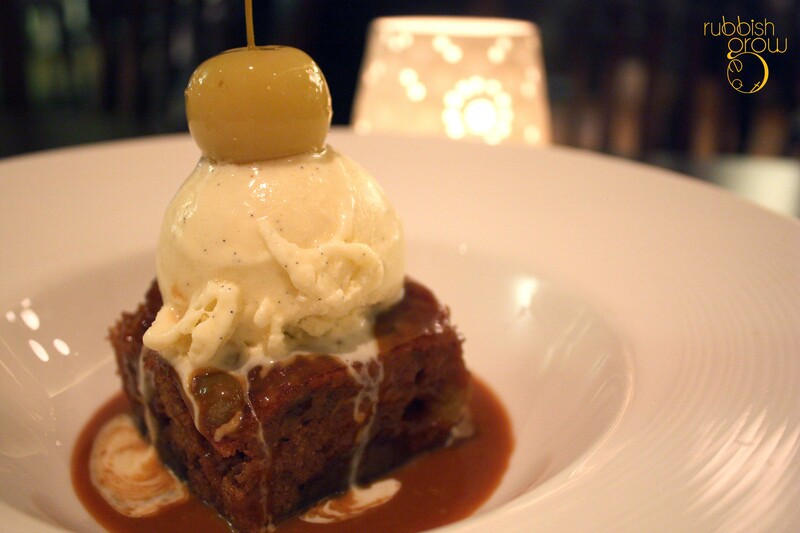 Steamed toffee and date pudding ($14) topped with vanilla ice cream is also different from elsewhere. The date pudding, like the French onion soup, has a homely and hearty touch, with large chunks of dates in it. The pudding isn’t as dense as it has pockets of air. The tastes of the date and toffee are distinctive. This is a wonderful dessert to end the meal. 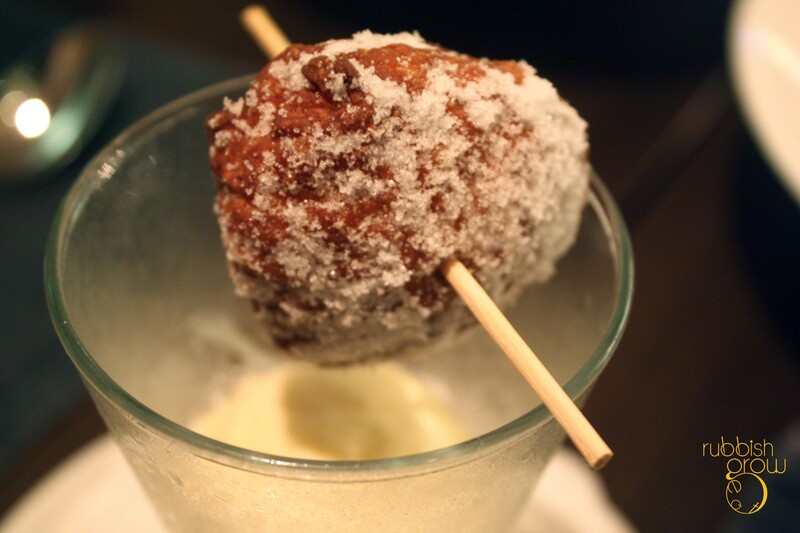 Another specialty is the homemade doughnuts ($14) with vanilla ice cream and strawberry fricassee (jam). The inside of the doughnut is a yellow-orange, reminiscent of using a sweet-potato flour, although it uses normal flour. Secret ingredient inside. The sugar is powdered lightly so the grainy texture contrasts beautifully with smooth doughnut. 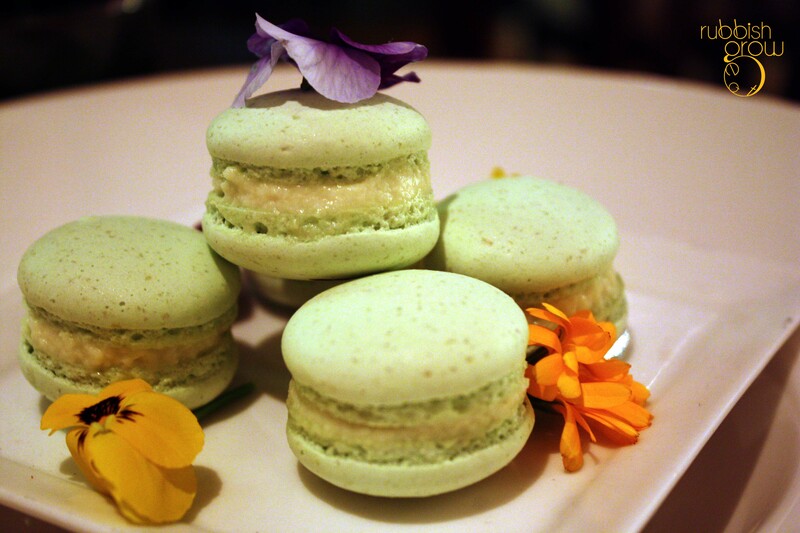 We were lucky enough to sample what Chef Sandri is about to launch: macaron! Overall, our expectations were exceeded. If there is a thing we could say, it is that we wish the servers were a wee bit more attentive in refilling our glasses. Food-wise, this is one perfect culinary experience. Every dish ranges from good to perfection. After this trip, we become fan girls of Chef Sandri! All day dining on PH. PS: We thank Chef Sandri and Fransisca for the invite and the wonderful hospitality.